Midtown Manhattan—with its noise, traffic, slow-moving tourists, and overpriced everything—is the one place most New Yorkers avoid at all costs (if they can help it.) It’s also home to Trump Tower, a gargantuan gold-plated phallus jabbed straight into the city skyline where the President-elect is planning on spending weekends during his term in office. 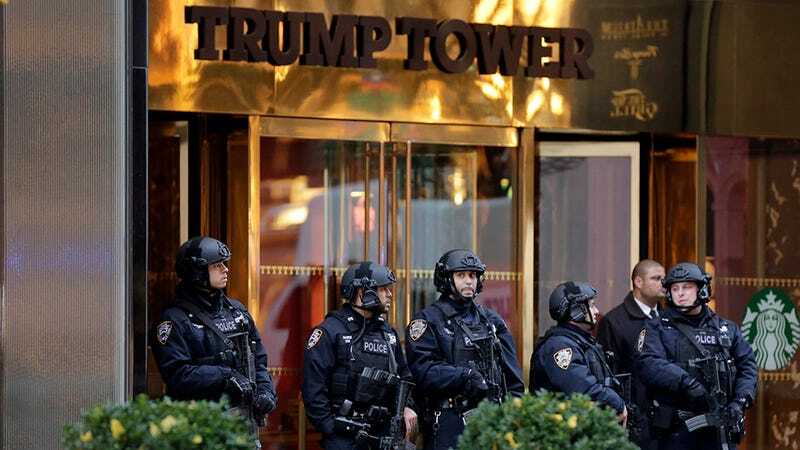 In a neighborhood as densely populated as Midtown, the necessary job of keeping Trump safe will lead to unprecedented hassles for those living and working in New York, a city which already earns its stripes as having the country’s worst workday commute. The Washington Post reports today just how bad things are going to get. For starters, the no-fly zone the FAA declared over Trump Tower is likely to stay in place for the next four years. That will also be extended to a ground perimeter in a “five- to 10-block radius” around Trump Tower, further miring traffic and restricting pedestrian access—and diminishing patronage to local businesses in the area. The New York Times reports that limitations on civilian access to Trump Tower has already started. When Air Force One [...] arrives at New York’s John F. Kennedy International Airport, the tarmac will be frozen for at least 15 minutes before it lands [...] A single presidential visit costs the Port Authority of New York and New Jersey, which runs the city’s airports, $100,000 to pull off. With repeated, regular trips, price tags, delays and frustrations will scale up, quickly. Anyone unfortunate enough to work or (god help them) live in Midtown will no doubt be inconvenienced. Getting anywhere will take longer, and strategically placed heavily armed personnel will become a regular part of the Manhattan scenery. But worker and commuter experiences will pale in comparison to what residents of Trump Tower who will be subjected to. [E]veryone who enters and exits the building will have to be vetted by the Secret Service, even if the Trumps aren’t there. At the very least, their names will be run through agency threat databases. The service will want to inspect every package that goes into the building and will insist that staffers [...] be scanned with a hand-held magnetometer [...] When Trump is there, all of their personal effects will probably be checked by bomb-detection dogs, too [...] Occupants might have to surrender some privacy as agents look to monitor incoming phone calls and even Internet traffic. One bedroom apartments in Trump’s eyesore start around 2.1 million. Those people are likely hoping for a refund right about now.